Can 'Get Out' Scare 'Lego Batman' Off the Top Box Office Spot? Can ‘Get Out’ Scare ‘Lego Batman’ Off the Top Box Office Spot? 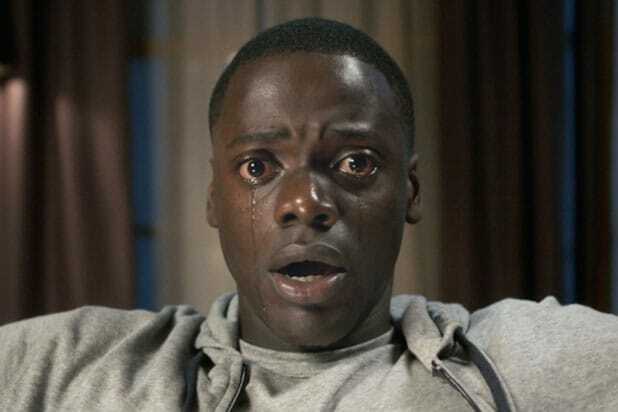 With a trailer that has over 30 million views and unanimous praise from early reviews, “Get Out” could be a big horror hit for Universal Pictures as it debuts this Friday. Some analysts believe it even has a chance to knock “The Lego Batman Movie” off the top box office spot. Universal has put out a conservative estimate for Jordan Peele’s $4.5 million directorial debut, expecting a weekend return in the high teens as it opens in 2,773 locations. But independent trackers tell TheWrap that “Get Out” could make as much as $24 million. That would be enough for the film to at least take the No. 2 spot from “Fifty Shades Darker,” which made $24 million in its its second weekend in theaters. “Lego Batman,” meanwhile, held on to the top spot at the domestic box office last weekend with a three-day total of $32.6 million from 4,088 screens. Analysts tell TheWrap that “Get Out” is very likely to beat “Lego Batman” on Friday, but to win the weekend it will need at least a 20 percent drop-off from “Lego Batman” combined with strong word of mouth from early moviegoers. If “Get Out” wins the weekend, it would be the second big victory of 2017 for Blumhouse Productions, which saw its last film, M. Night Shyamalan’s “Split,” make $40 million in its opening weekend en route to a worldwide cume of $194.5 million. “Get Out” hopes to enjoy the same success with a culturally-relevant parable about an African-American man (Daniel Kaluuya) who discovers that the parents of his upper-class white girlfriend (Allison Williams) are part of a sinister group in their hometown that has led to the mysterious disappearances of several black men. Peele is directing and writing the movie, as well as producing with Jason Blum, Sean McKittrick and Edward H. Hamm, Jr. The film also stars Catherine Keener, Bradley Whitford, Caleb Landry Jones, Lil Rel Howery and Keith Stanfield. “Get Out” should have little competition from other new releases, which include Open Road Films’ “Collide” and Lionsgate’s “Rock Dog.” “Collide” is expected by trackers to make $5 million this weekend against a $29.5 million budget from approximately 2,000 locations. The action film stars Nicholas Hoult as an American backpacker who ends up getting involved with drug dealers in Germany. Soon, he finds himself in danger as his employers hunt him down on the famous speed limit-free roads of the Autobahn. Felicity Jones, Anthony Hopkins and Ben Kingsley also star in the film. It is directed and written by Eran Creevy and produced by Joel Silver, Ben Pugh, Brian Kavanaugh-Jones, Rory Aitken and Daniel Hetzer. It has made $2.5 million from nine overseas markets, including China. “Rock Dog” set a record for the most expensive animated film backed by a Chinese studio with a budget of $60 million. Released by Huayi Brothers, the film was an overseas bomb, making only $7.2 million in China and South Korea. Trackers expect it to make another $7 million here from an estimated 2,050 screens. Based on a graphic novel by Zheng Jun. It stars Luke Wilson as a Tibetan Mastiff who leaves behind his life with a family of guard dogs to find stardom as a rock musician in the big city. Directed by Ash Brannon, the film also stars Lewis Black, J.K. Simmons, and Eddie Izzard. Jun is producing the film with Amber Wang, David B. Miller, Rob Feng and Joyce Lou. It's easy to assume big Oscar movies come out late in the year. And while that is the case with some films, like frontrunner "La La Land," there are more than 30 Oscar-nominated films you can grab on home video or stream right now. One Oscar nomination, for Achievement in Sound Editing. Available on DVD and Blu-ray, as well as streaming retailers. One nomination, for Best Documentary Feature. One nomination, for Achievement in Costume Design. Available from streaming retailers now, with a home video release on Feb. 28. Nominated for eight Oscars, including Best Picture and Best Director for Denis Villanueve. One Oscar nomination, for Best Actor in a Leading Role for Viggo Mortenson. Two nominations, for Sound Editing and Visual Effects. One nomination, for Best Visual Effects. Available from streaming retailers, with DVD and Blu-ray release on Feb. 28. One nomination, for Best Documentary Short Subject. Available from streaming retailers, with a DVD and Blu-ray release on March 21. Two Oscar nominations, for Best Actress in a Leading Role for Meryl Streep and Costume Design. Nominated for six Oscars, including Best Picture and Best Director for Mel Gibson. Available now on Blu-ray, DVD and digital HD. One nomination, for Achievement in Production Design. Four nominations, including Best Picture and Best Supporting Actor for Jeff Bridges. 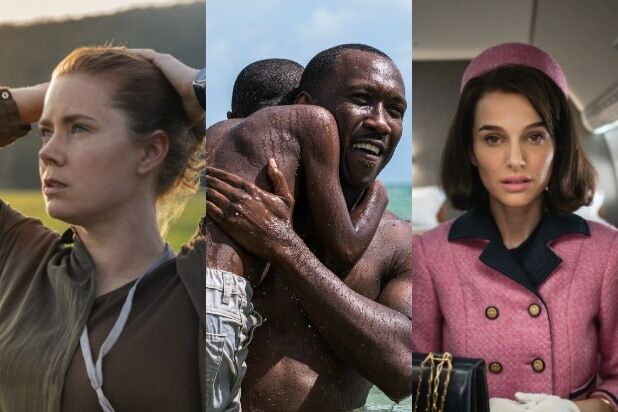 Three nominations, for Best Actress for Natalie Portman, Costume Design and Original Score. Available from streaming retailers, with a DVD and Blu-ray release on March 7. "Jim: The James Foley Story"
One nomination, for Best Original Song for "The Empty Chair" by J. Ralph and Sting. Available on DVD and Blu-ray, streaming retailers and HBO. Available on Netflix, DVD and Blu-ray, and streaming retailers. Two Oscar nominations, for Best Animated Feature and Best Visual Effects. Available on Amazon Prime, DVD, and streaming retailers. One nomination, for Best Original Screenplay for Yorgos Lanthimos and Efthymis Filippou. Available on Amazon Prime, DVD and Blu-ray, and streaming retailers. One nomination, for Best Actress for Ruth Negga. Nominated for six Oscars, including Best Picture and Best Director for Kenneth Lonergan. Two Oscar nominations, for Best Foreign Language Film and Achievement in Makeup and Hairstyling. Eight nominations, including Best Picture and Best Director for Barry Jenkins. Two nominations, for Best Animated Feature and Best Animated Song for "How Far I'll Go" by Lin-Manuel Miranda. One nomination, for Best Supporting Actor for Michael Shannon. Available on WatchESPN, DVD and Blu-ray, and streaming retailers. One nomination, for Best Animated Short. Available on its own from streaming retailers. or as an extra feature on the DVD and Blu-ray release of "Finding Dory." One nomination, for Best Foreign Language Film. One nomination, for Best Original Song for "Can't Stop the Feeling" by Justin Timberlake, Max Martin and Shellback. One nomination, for Best Animated Feature.